The new performance royalty rates that internet radio will pay artists and record labels were released on December 16 and many small and mid-sized internet-only broadcasters are now fearing.... While there was a modest increase on the fee paid for each song played, the bigger concern is what’s missing. Since 2009 webcasters with lower revenues have been able to pay rates based upon that income, rather than based on tracks played and audience size. Under the Webmaster Settlement Act of 2009 (WSA) stations with less than $1.25 million in revenue were able to pay a percentage of that in royalties ranging from 12% to 14%. That agreement was made between SoundExchange, which negotiates and collects performance royalties on behalf of copyright owners, and a group of internet radio stations. However, the WSA ended on December 31, 2015 and there is no new agreement to take its place. This means that all internet broadcasters that qualified for revenue-based royalties in 2015 will now have to pay based upon the number of performances. This is calculated based upon the number of tracks played multiplied by the number of listeners to each track, which is then multiplied by the rate of $.0017 per performance. So, if a station averages 100 listeners at any given time and plays an average of 15 tracks an hour, then it has 1500 performances an hour, 36,000 per day, and 13,140,000 performances a year. This adds up to a royalty of $22,338 a year. To understand how significant this change might be, consider that 100 average listeners isn’t a very big audience. So even if a webcaster were able to make $100,000 a year–equivalent to the budget of a small community radio station–the royalty obligation under the WSA would have only been $12,000. However, it’s more likely that a webcaster with that size audience would have a hard time making even $12,000 a year. For very small webcasters with little actual operating revenue the cost of doing business threatens to greatly outweigh actual income. Rusty Hodge is the founder of San Francisco based internet radio group SomaFM, which operates 25 commercial-free, listener-supported music channels. Via email he said that given current listenership and use, he estimates that SomaFM’s royalty costs could increase by as much as 10 times, up to about $20,000 a month. He does caution that because the full text of the CRB’s ruling has yet to be published, the full impact on SomaFM is still unknown. Hodge also explained that the station is considering a number of cost saving measures to limit the number of performances SomaFM has to pay for, like implementing two-hour connection limits. Such measures can help ensure that a stream is being actively listened to, rather than playing to an empty room. “We’ve already started dumping connections after four hours, and that’s lowered our usage (and hence royalties) by 10% already,” he said. Because several SomaFM stations emphasize small labels and independent artists, another approach is working with those who are willing to allow their music to be streamed royalty-free in exchange for links to their website or other consideration. “We expect that we’ll have 95% of the content on Drone Zone be direct licenses, and that’s our 2nd most listened to channel,” Hodge said. He also predicts that SomaFM will be able to direct license at least half the music for the Groove Salad channel. Nevertheless, strategies like these may not be sufficient for many webcasters to keep their operations going if no WSA replacement comes to fruition. Then, the all-too-realistic scenario is that thousands of US-based small webcasters will be forced to end broadcasts because they’ll be unable to pay the new performance royalty rates. Such a mass exodus may come as soon as the end of January because of the dire situation of the longstanding internet broadcasting platfo... which is facing the dual challenges of the royalty rate increase and a loss of investor funding. Live365 hosts thousands of streaming stations, most of which would go silent if the service shuts down. 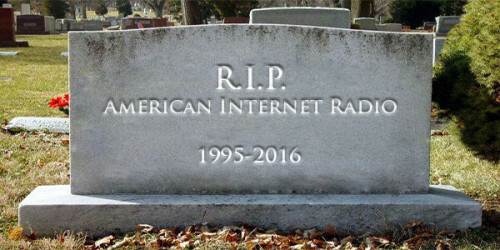 The predicted loss of small and medium internet radio stations would be a devastating blow to the internet as a viable broadcasting alternative to terrestrial radio. In effect, launching a sustainable internet music station will require as much start up capital as building or buying a terrestrial radio station. David Porter, the founder of the 8tracks streaming platform, estimates that it will require at least $10 to $15 million to enter the internet radio market in the US. Of course, there also would be a devastating reduction to the diversity of broadcasts available on the internet. While non-commercial terrestrial stations and internet-only college stations are unaffected by this change, the internet radio world is home to countless stations that cater to niches and interests that are barely ever heard even on the most cutting edge terrestrial signals. Smooth Jazz Chicago is one internet broadcast that exists to fill a niche that is nearly gone from terrestrial radio. The three year-old station is one of the first casualties, having shut down operations on December 31. According to an open letter by founder Rick O’Dell, the station could not absorb the rate increases. Though it is reasonable for both listeners and internet broadcasters to be gravely concerned, the timing of the CRB’s decision coming so close to the end of the year and just before the holidays means that there may yet be opportunities for relief. The still upcoming release of the full text of the CRB’s ruling could open a window for a new WSA-like settlement from SoundExchange, though webcasters will probably have to organize quickly in order to make their case. Webcasters also may look to their Congressional representatives to intervene and apply pressure on SoundExchange or the CRB. A petition to Congress started on December 27 currently has over 1,700 signatures. Yet, with new rates now going into effect, under current law neither SoundExchange nor the CRB are obligated to make any adjustment. Small and mid-sized internet broadcasters and their listeners should hope that this looming threat is an oversight, or an unintended consequence, rather than a more concerted effort to quash independent webcasters. We’ll continue to watch the situation closely in the following weeks. RAIN News has been doing an excellent job covering this issue, which is not surprising–though still greatly appreciated–given the publication’s focus on internet radio. Another site to watch isNet Radio Blog, run by internet radio advocate Robin Henderson.